The Oba of Lagos, His Royal Majesty Rilwan Osuolale Akiolu, has called on Nigerians, particularly Lagosians, to ensure the return of President Muhammadu Buhari, Governor Akinwunmi Ambode, Rt. Hon. Mudashiru Obasa and Hon. Wasiu Eshinlokun-Sanni in the 2019 general elections. The Lagos monarch made this statement on Saturday in his palace when the Conference of Speakers of State Legislatures paid him a courtesy visit in the course of their quarterly meeting in Lagos. “They have done well. And going by their performances during the few years that they have been saddled with the leadership positions, they have shown to all and sundry that they can do more if given the opportunity again,” he said. He said: “Politicians can only do this by settling their differences amicably. Politics is characterized by alignment and re-alignment of personnel but in doing this, politicians should not take actions or make utterances that can heat up the polity. The Speaker of the Kebbi State House of Assembly and Chairman of the Conference of Speakers, Rt. Hon. 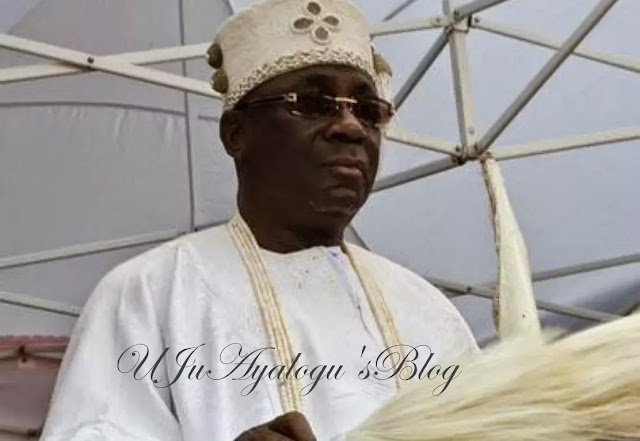 Ismaila Kamba, described Oba Akiolu as a man of honour and integrity. “As a policeman, I know you as an upright man and as a traditional ruler, you are still on the path of truth and the Rule of Law. I admire your courage and I thank you for taking time to host us,” Kamba said. Obasa, the host Speaker, described Oba Akiolu as a supporter of truth and an agitator for justice. “He has been a pillar of support for us. He has always stood by us and we have been drinking positively from his fountain of knowedge and wisdom,” Rt. Hon. Obasa said.